I missed a week last weeks blog entry. I thought it might feel like the weekly chain had been broken and everything comes tumbling down. But it doesn’t so there’s that. The week before last was really busy sorting out travel for events and writing talks, being social and also family stuff. Today is Monday Oct 1. Yesterday I got back from Amsterdam which already feels like a blur. Meeting people I admire, 3 talks in 4 days, 2 day workshop, new faces and lots of good conversation, oh and tiny but cold Dutch beers, lots of them. The talk went really well. I enjoyed it a lot. I spoke along side a fantastic lineup: Astronomer and writer Pippa Goldschmidt, the speculative fiction writer E. J. Swift, Maja & Nik from FOAM, Ivan Henriques presented his [Symbiotic Machines for Space Exploration] project, and Miha Turšič from Waag spoke on his new project with the ESA. What I was doing there talking about Land as Platform and Solarpunk remains a mystery. I also gave a long presentation to interdisciplinary students doing an MA in worldbuilding. On (unsurprisingly) world building but more importantly reality hacking. And I spoke on solarpunk and they way it can be used to speculatively re-imagine civic space at Tolhuistuin. In-between all that, I caught up with a friend I haven’t seen in ages, and attended a two day workshop at Waag on world building which was the third part of the same workshop I’d been in at Het Nieuwe Instituut earlier in the year. My output was a short story about a baker in late 21st century Amsterdam who’s business partner is the yeast called (Hono) he uses to make all the bread. They work as a bio-coop. Also if there is such thing as Middle Ages High Catholic sci-fi that’d be his world view. Also Ben Cerveny from The Foundation For Public Code and The New Normal took me and Sjef for a ride on his boat. 1. You, personally, get to decide where you put your attention. 2. By acknowledging this fact you have to take full responsibility for where you have put your attention in the past, and where you will put it in the future. This is last weeks episode. Its had the most positive feedback of any show i’ve done so far. I’m really grateful for all the positive remarks. got a lot more on my pate. I need to write a talk on conspiracy theories for unsound.pl more on that next week. Also super energised after all the conversations In the last week. Much to think on in terms of my own life and what I want from it. 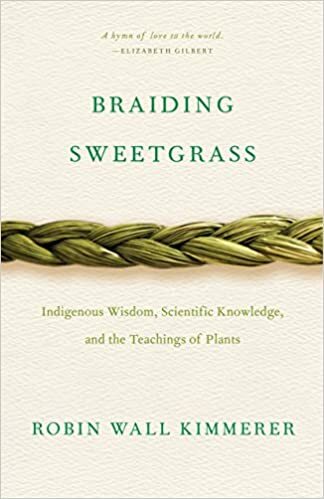 I finished Braiding Sweetgrass: Indigenous Wisdom, Scientific Knowledge and the Teachings of Plants on the plane on the way home. Incredible book.